The Uprising of Namwell coming SOON !!! 06-04-2016 The first performance of a show we've been preparing for a long time! Soon to be Dead, Lord Shades’ new ally! 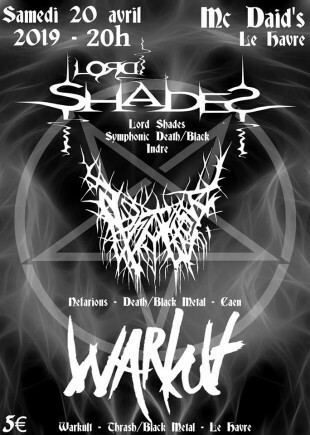 06-06-2015 The successful alliance between Lord Shades and Soon to be dead, and new concerts coming up... Get ready ! 05-05-2015 Brainstorming on the next opus, ideas are flowing, the first riffs are beginning to take shape. Release of the new French Metal compilation! 10-17-2012 The photos and videos of Wacken 2012 are online! The show in Châteauroux was a success! 10-01-2012 We organised our first concert at the 9Cube, France, and everything went well! 09-26-2012 Report after our return from Wacken 2012. It was awesome! LORD SHADES AT WACKEN OPEN AIR 2012!!! LORD SHADES IN THE WACKEN METAL BATTLE 2012 FINAL! 03-31-2012 We’ve been chosen to perform at the Wacken Metal Battle final! 03-24-2012 New album, new website, come and see! We are back with fresh news ! Welcome to the new site of Lord Shades!